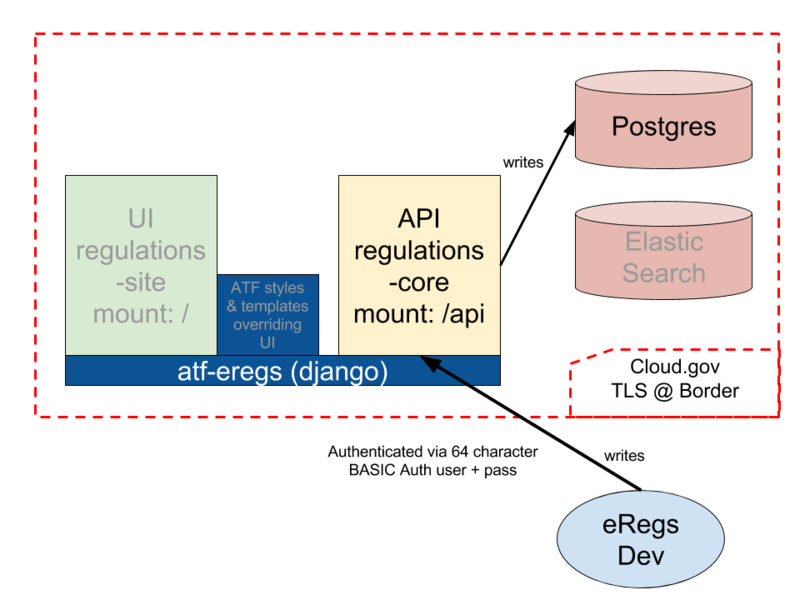 ATF eRegs is currently deployed on cloud.gov, a PaaS which abstracts away many of the annoying components of maintenance. As a result, this documentation (and the production configuration files) are largely geared towards hosting in this environment. See Non-Cloud.gov for other environments. This repository is a cloud.gov app which stitches together two large Django libraries with cloud.gov datastores and some ATF-specific styles and templates. The first library, regulations-core, defines an API for reading and writing regulation and associated data. 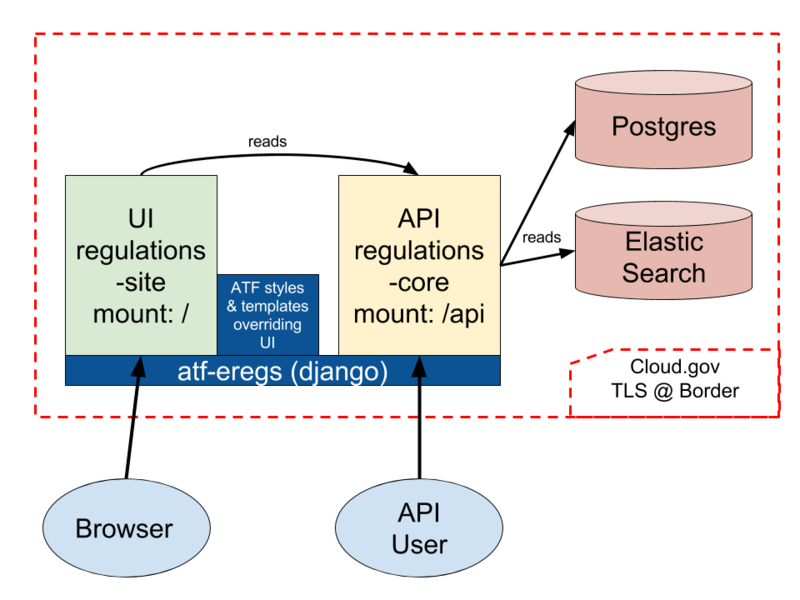 atf-eregs mounts this application at the /api endpoint (details about the “write” API will be discussed later). The second library, regulations-site, defines the UI. When rendering templates, regulations-site will first look in atf-eregs to see if the templates have been overridden. These views pull their data from the API; this means that atf-eregs makes HTTP calls to itself to retrieve data (when it’s not already cached). When there is new data available (e.g. due to modifications in the parser, new Federal Register notices, etc. ), that data must be sent to the /api endpoint before it will be visible to users. However, we don’t want to allow the general public to modify the regulatory data, so we need to authenticate. Currently, this is implemented via HTTP Basic Auth and a very long user name and password (effectively creating an API key). See the HTTP_AUTH_USER and HTTP_AUTH_PASSWORD credentials in cloud.gov for more. This updates the data, but does not update the search index and will not clear various caches. It’s generally best to cf restage the application at this point, which clears the caches and rebuilds the search index. Note that this will also pull down the latest versions of the libraries (see the next section); as a result it’s generally best to do a full deploy after updating data. If the code within atf-eregs, regulations-core, or regulations-site has been updated, you will want to deploy the updated code to cloud.gov. At the moment, we build all of the front-end code locally, shipping the compiled CSS/JS when deploying. This means we’ll need to update our libraries, build the new front end, and push the result. Confusingly, although the front-end compilation step occurs locally, all other library linking (in particular to regulations-site and regulations-core) takes place within cloud.gov. In other words, the setup process for cloud.gov will pull in the latest from regulations-site and regulations-core, regardless of what you have locally and regardless of what you’ve built the front-end against. Be sure to always update your local libraries (via pip) before building and pushing. curl -L -o cf.tgz "https://cli.run.pivotal.io/stable?release=linux64-binary&version=6.15.0"
tar xzvf cf.tgz -C .
To update, substitute cf uups for cf cups. If you’d like to move this application off cloud.gov, you will need to create an alternative settings file. Cloud.gov runs the following commands on each deploy (also described in the “manifest” files). Note that these commands are run within the context of a specific settings file, discussed shortly. The first, refresh, will migrate the database and populate the search index (we’ll see how to configure these in a moment). The command explicitly checks a cloud.gov attribute to determine if it is the “first” server (as we don’t want to run these migrations on each), but it degrades nicely outside of cloud.gov. If not within that environment, running refresh will always run the migrations and rebuild the search index. The second command, collectstatic, gathers all of the static assets (CSS, JS, images, etc.) into one location, for ease of hosting. See the Django docs on that subject for more. Note that this does not build the frontend assets. To do that, you’ll need to run python manage.py compile_frontend first. The final step starts the gunicorn server and points it to a WSGI file. This file sets up a New Relic monitoring agent and wraps the webapp with a static file hosting solution (whitenoise). Django does not host static files, deferring to a variety of other solutions. With a possible exception of the New Relic configuration (which pulls its credentials from cloud.gov), this should all work outside of the cloud.gov environment. The most complicated changes that would need to take place to move off cloud.gov are found in the atf_eregs.settings.prod settings file (which is interwoven as context throughout the deploy script). To make these changes, you may either edit this file (in which case we would strongly recommend committing these changes to a shared repository) or create a local_settings.py file within the same directory and only override the attributes needed. The DATABASES attribute uses the dj_database_url library to pull database connection information from the implicitly defined DATABASE_URL environmental variable. If defining such a variable is not feasible, the DATABASES attribute can be configured manually through traditional settings. The current prod settings file overrides HTTP_AUTH_USER and HTTP_AUTH_PASSWORD with values derived from cloud.gov. By default, however, those credentials are defined by similarly named environment variables. They can also be manually configured in a settings file. These are used to lock down write access to the API. The ALLOWED_HOSTS setting must be configured when DEBUG is turned off. It should contain a list of hostnames that the Django app should respond to; the current prod settings file pulls these from the cloud.gov environment. See Django’s documentation on the topic for more details.